Montana, and Montanan’s are famous for understatement, so when a place out here is named Paradise Valley it certainly deserves further exploration. With Yellowstone’s Edge located smack-dab in the middle of the Valley, it’s a short hop to the “Paradise” most people miss as they drive from Livingston to Yellowstone National Park. 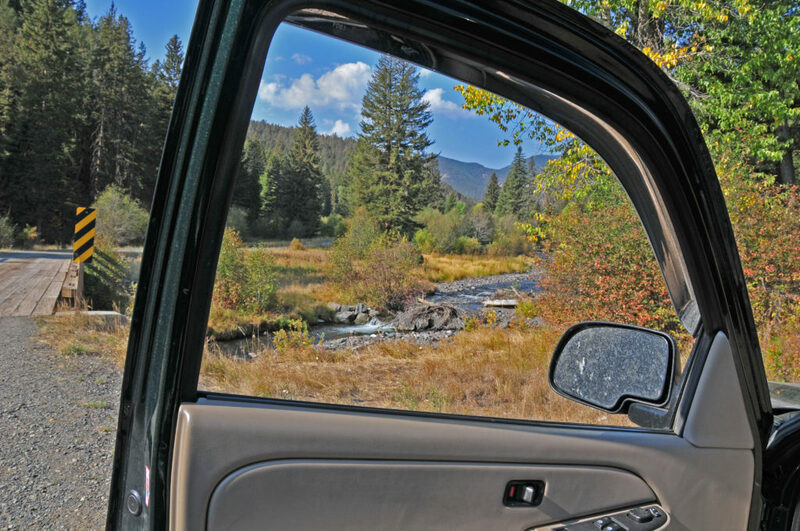 A couple of options can be done from your vehicle and provide a relaxing change of pace from the hustle and bustle of the Park. Pack a lunch, throw in your camp chairs, and don’t forget your book. If you’d rather lace up your hiking shoes and fill your lungs with our “Big Sky” fresh air we can point you to a dude ranch that once hosted President Roosevelt, fell into disrepair, and is now being restored to its former splendor, thanks in part to its herds of resident elk. 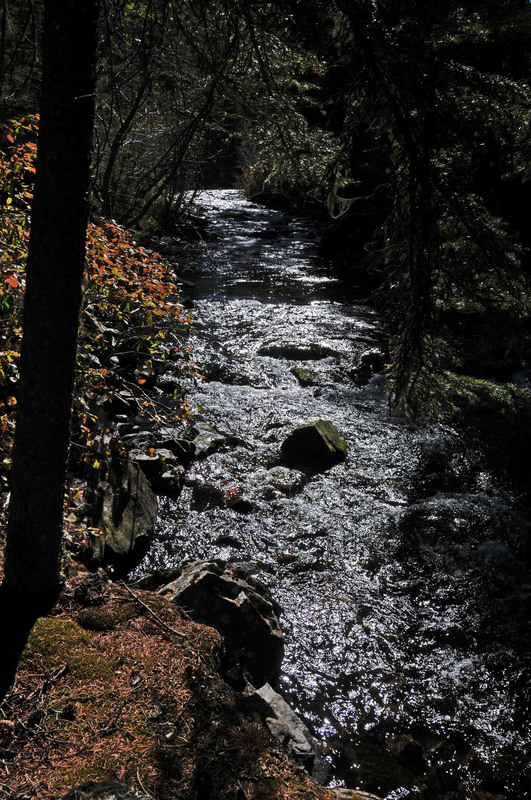 Or perhaps a quiet hike up Passage Creek, or a nice walk to the waterfall at Pine Creek. Don’t forget to tighten those laces for the hike down! The town of Livingston is full of great galleries, world-class restaurants, and hand-crafted retailers awaiting your visit. When a rough & tumble railroad town gets discovered by writers, sculptors, painters, photographers, musicians and movie stars it makes for a lively place…we suspect you’ll fit right in…. With a population of a million people spread over 147,000 square miles, Montana ranks 3rd in the US’s list of least densely populated states. 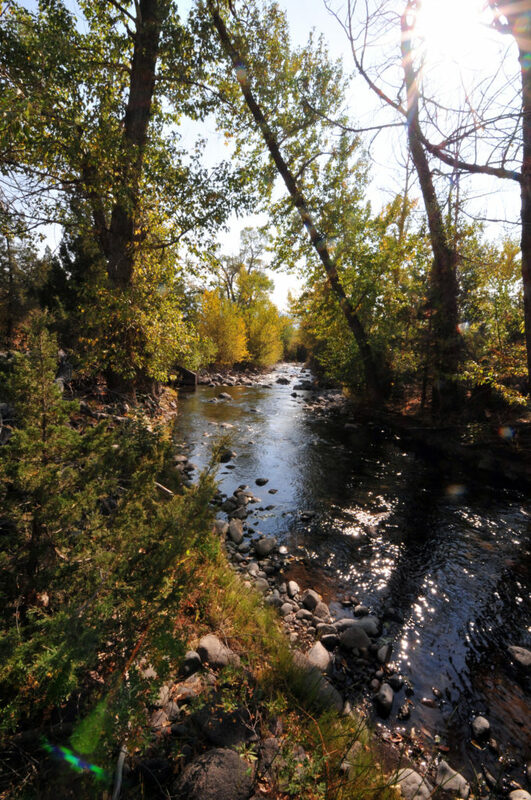 Let’s face it, some days you’d like to have it all to yourself… Mill Creek just might be your place. 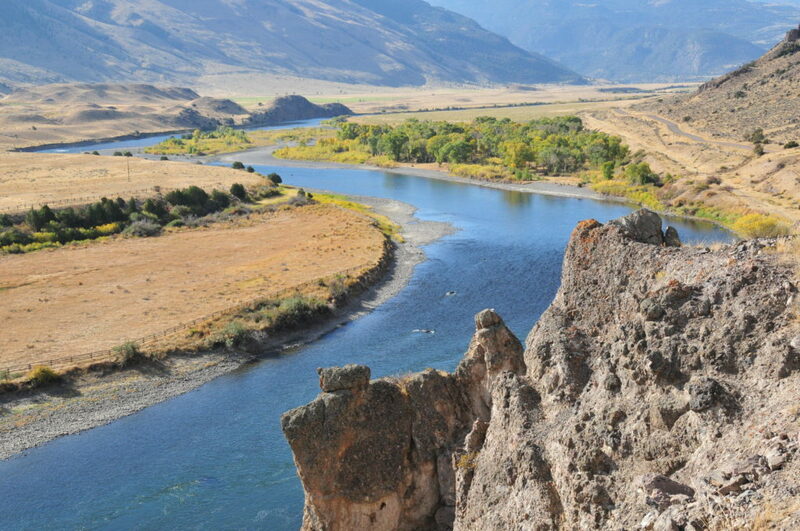 After living on the edge of the mighty Yellowstone, Big Creek might seem optimistically named. But if you seek wilderness and solitude it’s worth the short ride. Zero your trip odometer as you leave Yellowstone’s Edge and turn left on Hwy 89 South. 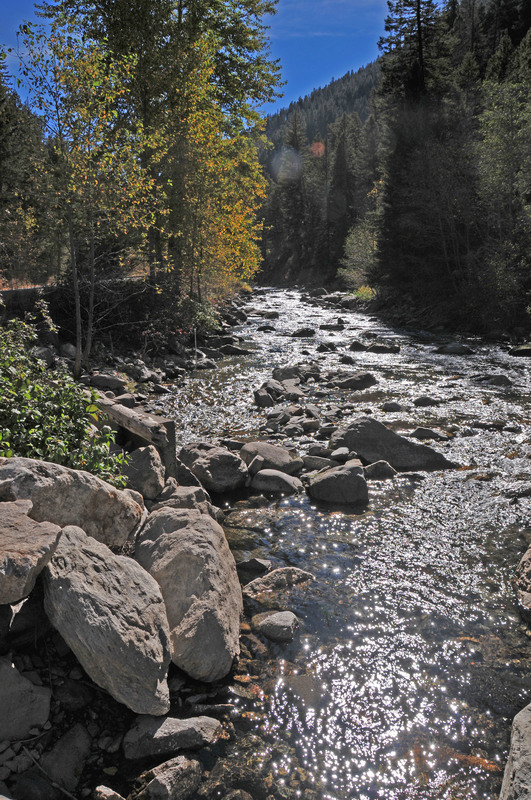 Follow the river south for 11.0 miles, and then turn RIGHT on to Big Creek Rd at the sign for Mountain Sky Guest Ranch. Here the road turns to gravel and you’ll soon see a huge Osprey nest on top of a pole on your right side. This has been a very productive nesting site in the last few years, keep your eyes peeled for adult birds on either side of the road. The road will climb gently with nice views of Big Creek on your left. At mile 14.0 you’ll cross the creek and there is a sizable pull-off on your left. Opposite this is a primitive Forest Service campsite with a picnic table and nice access to Big Creek. Upstream from here 100 yards is a nice pool below a big boulder that often holds feisty trout. At 14.6 the road splits and fisherman should explore the right fork for more holding water. The left fork will take you toward Mountain Sky Ranch at mile 15.7. After the resort the road narrows and the views open up to some peaceful meadows and that Montana “Big Sky”. There is another camping area at mile 16.7, this one with an outhouse on the left side of the road. At mile 17.1 you’ll reach the parking area and the trailhead for hiking and horse packing trails. There’s another outhouse here as well. When the afternoon heats up in the valley the Big Creek drive will offer you deep shade, cool water, an additional 1000 feet of elevation, and a chance to quietly explore in your own back yard. Pack a picnic, bring your camp chair, slip off your shoes and read that book with your toes in the water. Just don’t get too relaxed….remember, the campfire outside the office starts at 7:00 P.M., we’ll want to hear about your day…..
***a note about driving Big Creek… PLEASE drive slowly. The road follows the creek and very little of it is straight. Around that next blind corner could be a herd of deer, a flock of turkey, a propane truck or giggling 8 year olds on horseback. And by going slowly with the windows down you just might hear our Western Meadowlark. In the 1920’s if you addressed a letter to: Dude Ranch, Montana, that letter would have been delivered to the OTO Dude Ranch, the first dude ranch in Montana. Started in 1912, Dudes and Dudettes came west for a western ranch experience. And business was good! 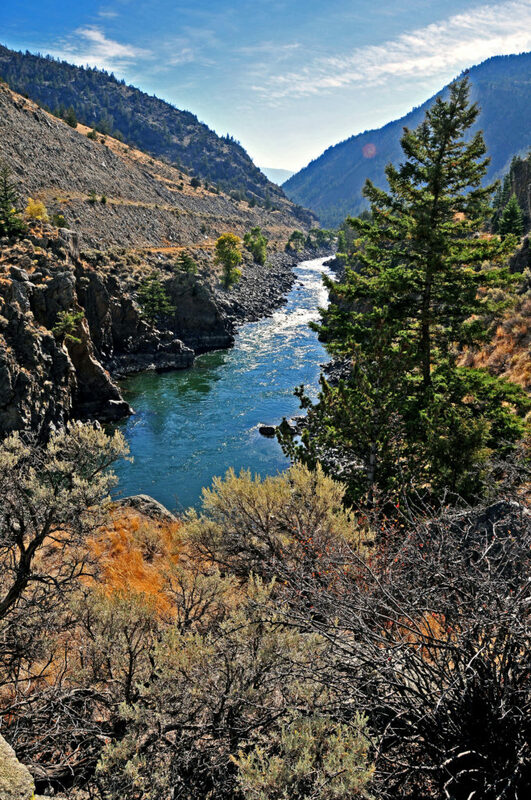 In 1934 the OTO was purchased by Chan Libbey, Sr., grandfather of Yellowstone’s Edge Chan (who is the III). 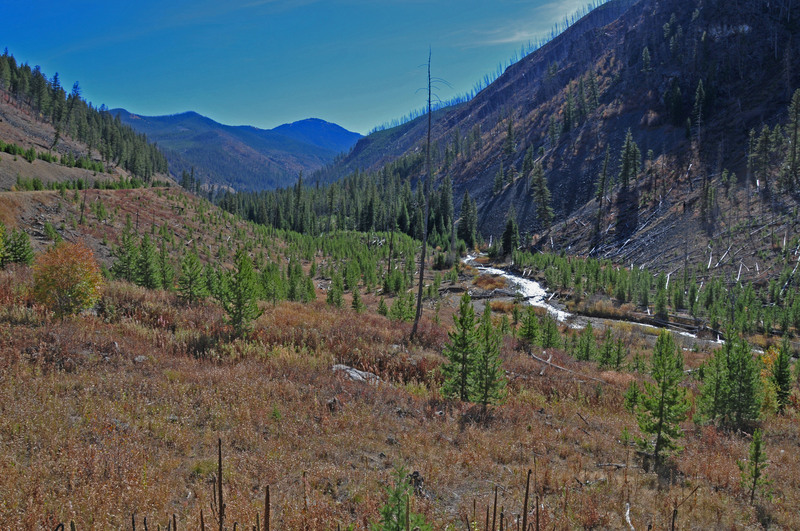 After closing in 1939, the 3,265 acres became more important to the local elk, and this led to the OTO being eventually acquired by the Rocky Mountain Elk Foundation to protect this habitat. 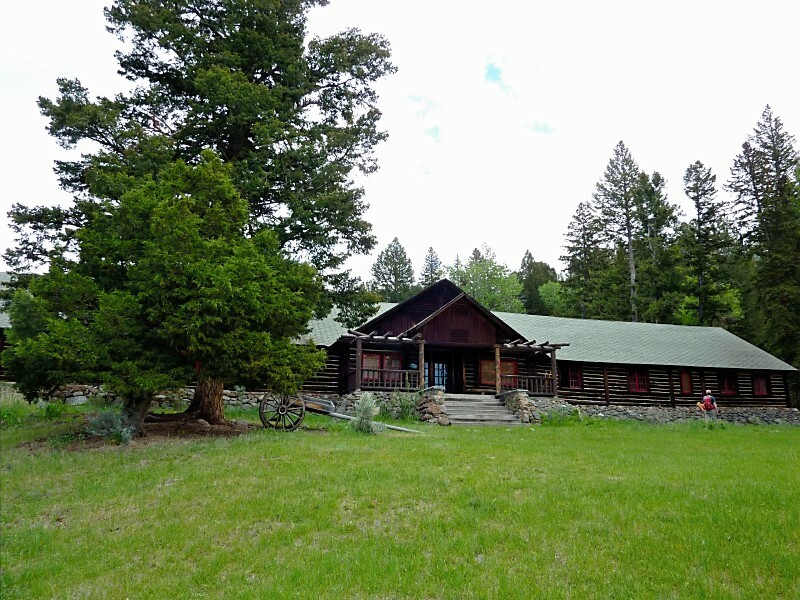 The Elk Foundation turned ownership over to the U.S. Forest Service and an ongoing effort, largely by volunteers, is restoring the buildings and grounds to their former splendor. From Yellowstone’s Edge, turn south on Hwy 89 (toward Gardiner). A few miles after leaving Yankee Jim Canyon turn LEFT on Cedar Creek Rd. Follow this to the parking area/trailhead. The hike starts out steep but soon flattens to nice rolling terrain. You’ll be hiking on a well maintained dirt road, no heavy boots required. Figure you’ll be exploring the buildings and meadows of the OTO in about an hour. Don’t forget to tighten those shoelaces for the hike down! The five entrances to Yellowstone National Park welcome 3.4 million guests in an average year, virtually all of them traveling the same roads to enter the park. But as a guest at Yellowstone’s Edge we know you’re special, and we’d like to offer you a special approach to (or from) the park’s North entrance. Zero your trip odometer as you leave our RV park, and turn LEFT on Hwy 89 towards Gardiner. After 13.9 miles you’ll turn RIGHT on to Old Yellowstone Trail. Keep your eyes open here, these meadows on both sides of Hwy 89 are home to Elk and Antelope. The road here is gravel and will climb to a great overlook at mile 14.8. Here you’ll be directly above the Point of Rocks fishing access site, with great views both up and down the valley. At mile 18.2 the road up Rock Creek will be on your right, and at mile 18.5 you can bear LEFT to return to Hwy 89 via the Carbella bridge. At mile 19.3 the road will fork, with the left hand fork taking you towards the park, and the right-hand fork sending you up into the National Forest land in the Tom Miner Basin. At mile 19.8 your cross under an arch, and the no trespassing sign is for the land on either side of the road, not the road itself. At mile 20.7 you’ll enter Forest Service land, and the start of Yankee Jim Canyon. “Yankee Jim” George settled in this area in the fall of 1871, just four months before Yellowstone was declared our first National Park. Yankee Jim spent the next 18 months making improvements to the wagon trail that connected Yellowstone to Bozeman, and in July of 1873, with the installation of a gate, created the National Park Toll Road. 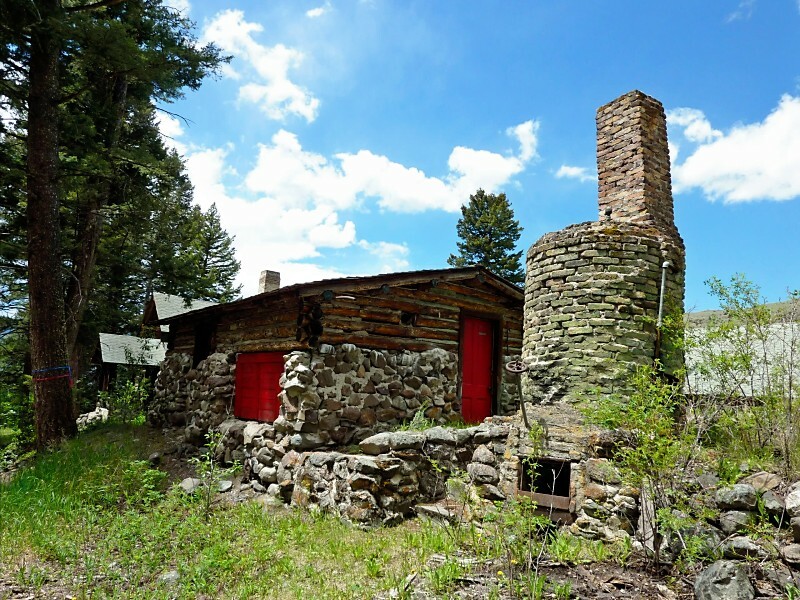 Food and lodging were provided to travelers from a rustic cabin, and for 10 years business was good. But the Northern Pacific railroad soon moved in, requiring detours in Yankee Jim’s road, and allowing easier and faster access to the Park. And in 1893 Jim sold his road to Park County for $1000. Jim continued to provide food band shelter to travelers, but in 1920, and in failing health, Jim sold his land and left the Canyon for the last time. At mile 22.1 you’ll find a picnic table and an outhouse, and a brief overview of Yankee Jim and the toll road. The road gets slightly rougher from here, and caution is advised in wet conditions. At mile 22.7 you’ll see a cattle guard in the road and a new, very substantial fence running up the mountainside. This is intended to keep bison that might wander out of Yellowstone contained, and to minimize the mingling of bison with domestic cattle. At mile 27.6 there is a sharp right hand turn that will take you up into the settlement in Cinnabar Basin. 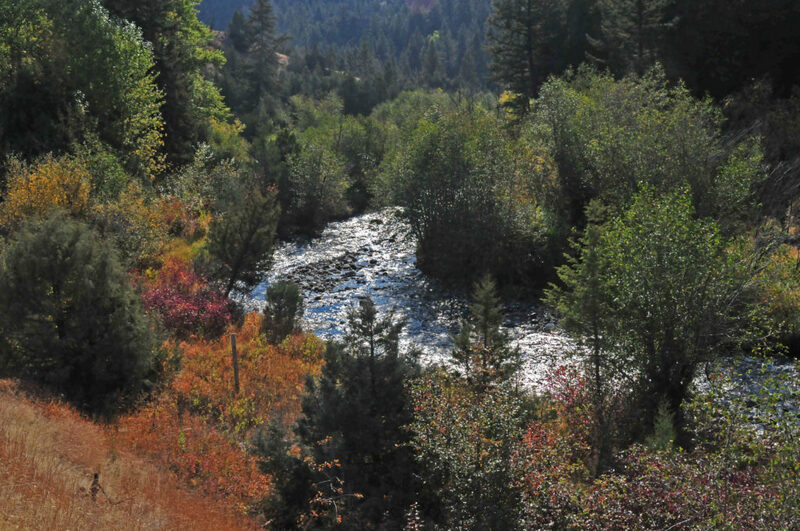 At mile 27.8 the Cinnabar Basin road will go left, over the river and back to Hwy 89. Just past this turn at mile 28.5 you’ll find a nice rest spot with a picnic table, outhouse and river access. At mile 31.6 you’ll enter Yellowstone Park land and you can continue to mile 36.6 where you’ll meet the pavement again at the Roosevelt Arch/ North entrance. LIVINGSTON, MONTANA – With a backdrop of the spectacular Absaroka mountain range, Livingston plays host to a variety of interests. Whether it is a tour through old downtown’s Sax & Fryer Book Store, a stop at one of the fly fishing shops, a stroll through the many art galleries or a culinary experience at any of Livingston’s restaurants, it is worth a day or more of investigation. Don’t forget to take a walk or drive along the Yellowstone River in beautiful Sacajawea Park where you will find numerous photography opportunities along the walking trail atop the river bank. Sacajawea Park is also where a number of summer events are hosted including the local farmer’s market and Summerfest. Growing up in Livingston, Montana, Chan came to appreciate the character of the community and the characters who defined it. He spent his childhood working with his father, who operated a wholesale beer distributorship in the old Coca Cola bottling plant on 5th Street where Chan’s grandfather had bottled Coke for a time. During Chan’s youth the ratio of saloons to churches was 24 to 26 or something like that. 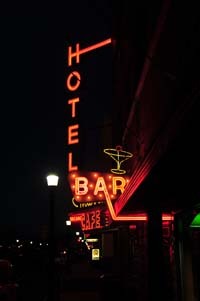 The diversified cast of characters making up the town’s population provided a lucrative clientele for each category of establishment. The local populace supplied the economy with trades based in cattle production, locomotive repair, timber harvesting, mining, outfitting and dude ranches. The colorful and historical collection of characters can be investigated at the Park County Museum located at 118 Chinook Street and the Historic Livingston Depot Museum along the railroad tracks on Park Street. A tour of these local museums will introduce you to a small town with a big heart and an amazing array of individuals who shaped the West. For example, Calamity Jane was known to frequent a number of the local establishments. You can ride by her old house location on a Livingston historical tour aboard the restored Yellowstone National Park bus. This community’s attractions and way of life grabs your sense of awe and pulls you in. Writers, artists, singers, actors, actresses & outdoorsman alike, gravitate to this area struck with this sense of place. Artists, Charlie Russell, Will James & writers such as Thomas McGuane, William Hjortsberg & Jim Harrison have claimed Livingston and Park County as first or second homes. Hollywood actors such as the late Warren Oates as well as present day actors like Dennis Quaid have found the tranquility and remoteness as a getaway from their other life. Resident singer John Mayer recently hosted a fundraiser for the Pine Creek Fire Department. The eclectic mix of talent fuels the town’s diverse selection of fly fishing shops, local restaurants, art galleries and supports a collection of businesses and services that will rival any big city fare. We invite you to this area and suggest that you stay a while to explore. Come be your own Lewis and Clark — oh, did we mention they came through, also. Plan to stay a while — this magical place won’t let go of you any time soon!! !